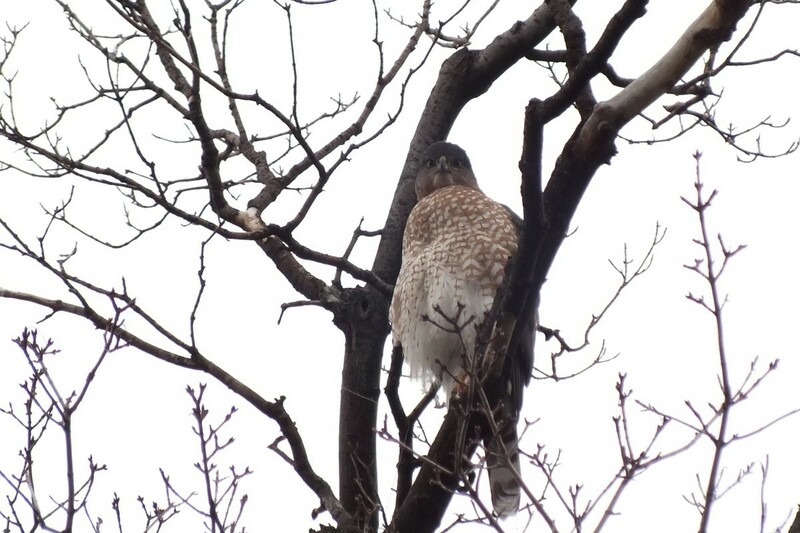 We sighted this Coopers Hawk sitting in a tree in Goldhawk Park in Toronto, Ontario. I think you would agree, it is only fitting that the bird landed in “Goldhawk” Park given its color and that it’s a hawk. 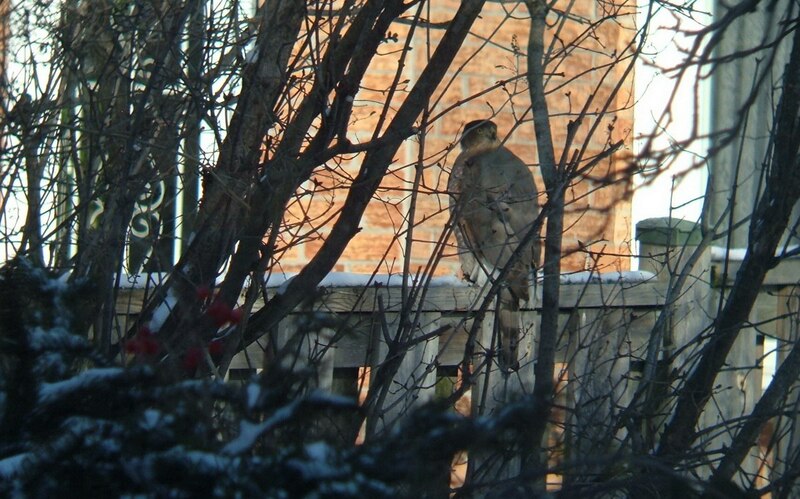 We have seen this Cooper’s Hawk frequently over the past few months, both in our backyard and in the surrounding area. 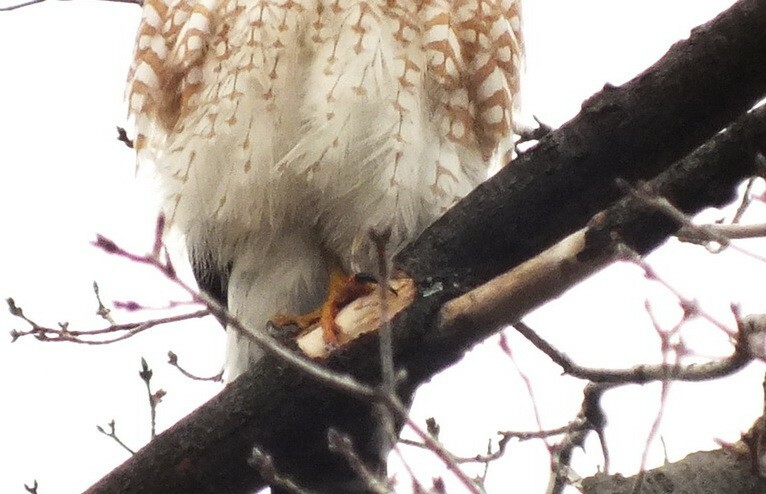 On this occasion, the hawk’s claws really bit into the tree branch upon which it was sitting. The damage it did to the tree branch gives you some idea of the instant death this bird can bring about when it latches onto its prey. 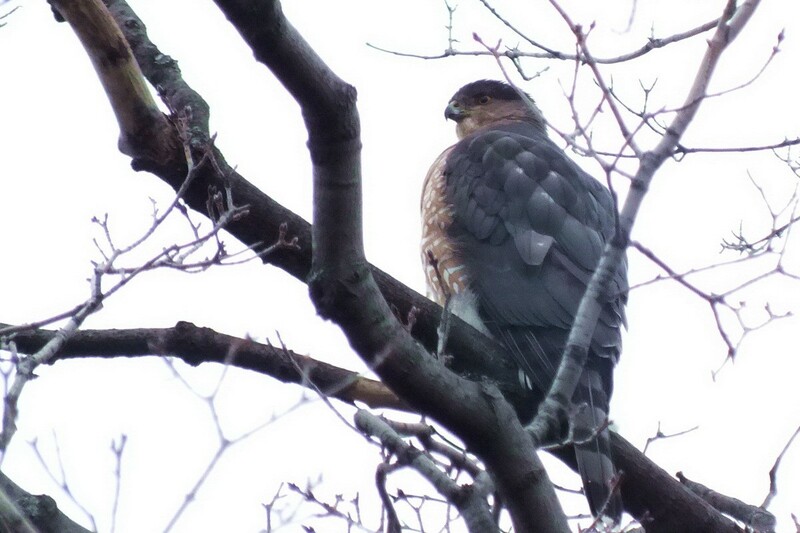 As you hear in this video that Bob recorded, the Cooper’s Hawk has a high-pitched call. Both at the beginning and end of the video, it calls out to Bob. Cooper’s Hawks are supposed to be a type of bird that communicates by using its voice, rather than putting on a major display of wings or body movement. On another occasion, this Coopers Hawk flew into my backyard, quite clearly looking for vulnerable birds that might make a good snack. It sat majestically above my nyjer seed feeder with its feathers all puffed up, maintaining a steady eye on everything around it. The hawk was in no rush, waiting patiently for some wayward bird that failed to notice his presence. After sitting on my arbour, the Cooper’s Hawk moved over onto my fence where it was slightly hidden by the limbs of a small tree. I have watched this hawk in the past, chasing small birds in amongst my cedars. It really is a cat and mouse game. Sometimes the hawk comes up empty handed, but on this day, the hawk managed to catch something. The Cooper’s Hawk likes to surprise its prey from a hidden position. Then, in a burst of speed, it swoops in for the kill. 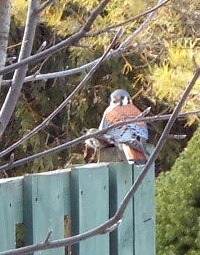 On this day, it used its slightly hidden perch on my fence to evade detection by other birds. Another overly eager bird, too intent upon reaching the nyjer feeder, paid the ultimate price. The eyes of a Cooper’s Hawk, like those of most birds of prey, face forward. Beyond being great flyers, it’s those eyes that enable the Cooper’s Hawk to hunt and catch prey at high speeds. The Cooper’s hawk made quick business of its catch. Carefully holding the prey with its talons, it proceeded to tear it into small pieces. I normally have a few Mourning Doves in my backyard, and I have learned that they are one of the most common types of birds that Cooper’s Hawks like to eat. They also enjoy eating Blue Jays, which I also see in my backyard on a regular basis. 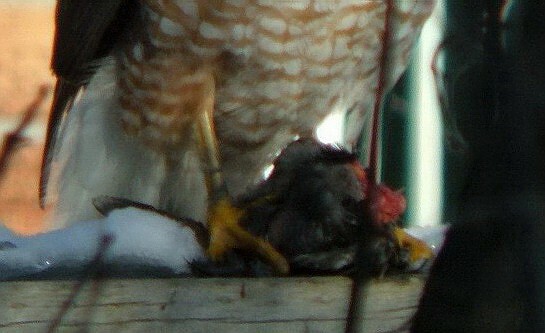 I wasn’t able to distinguish what the hawk was eating. It might have been a starling or even a black squirrel, judging by the black fur or feathers. According to one of my bird books, immature Cooper’s Hawks have yellow eyes, which change to a deep red color as the hawk matures. So, based upon the yellow eyes of this Hawk, I can only assume it is a juvenile. I have many different types of bird feeders in my backyard, which attract various species of birds…cardinals, juncos, sparrows, goldfinches, woodpeckers and blue jays. I always fear for these colorful and welcome visitors to my feeders whenever a hawk shows up. 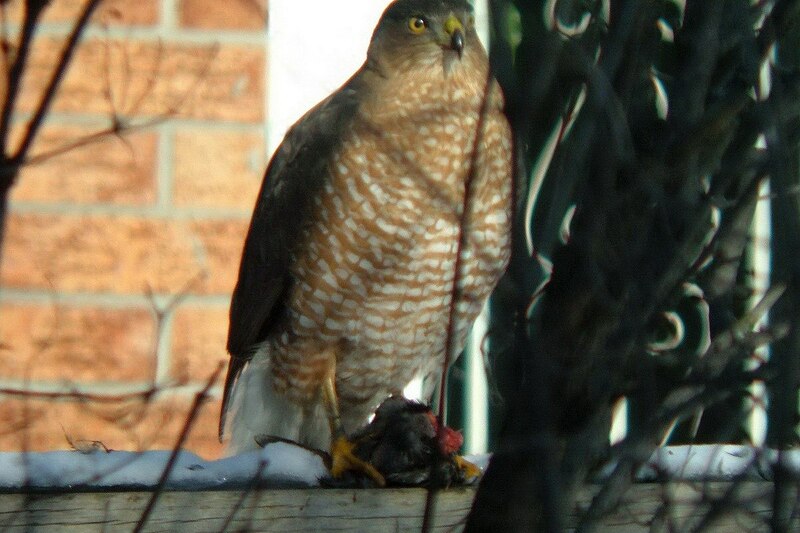 One year, I had another type of Hawk catching prey in my backyard. On that occasion, it was an American Kestrel (Falcon sparverius), or what some people call a Sparrow Hawk given its small size. 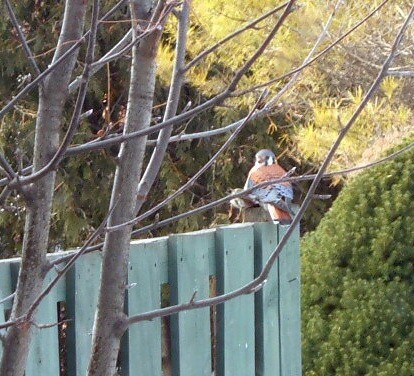 On that particular day, when I took this quick picture, the American Kestrel had just made quick work of another smaller bird in my backyard. 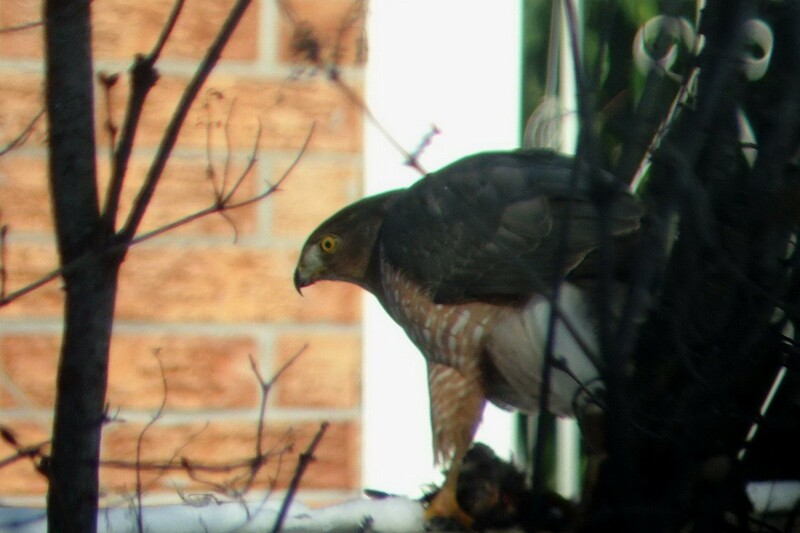 I feel very lucky to have been able to observe one of North America’s smallest hawks and one of its largest, the Cooper’s Hawk, going about life in my backyard. 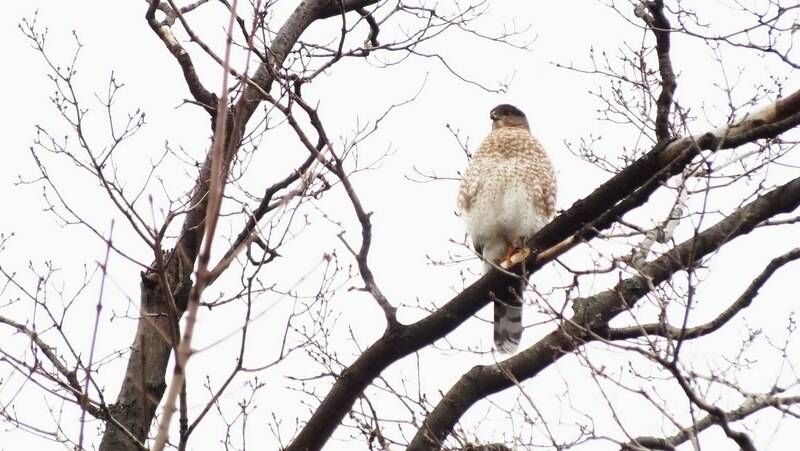 As the Cooper’s Hawk sat in the tree in Goldhawk Park, I was able to move around it on the ground below, and have a good look at its tail feathers. 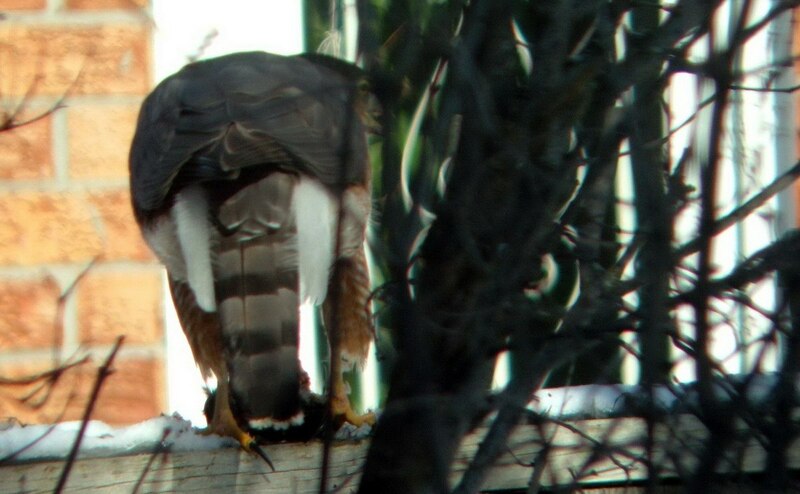 The tail feathers of the Cooper’s Hawk exhibit three distinct black bands as well as a white tip at the end of its tail. The Cooper’s Hawk did not miss a beat, moving its head from left to right, taking in all movement around it. 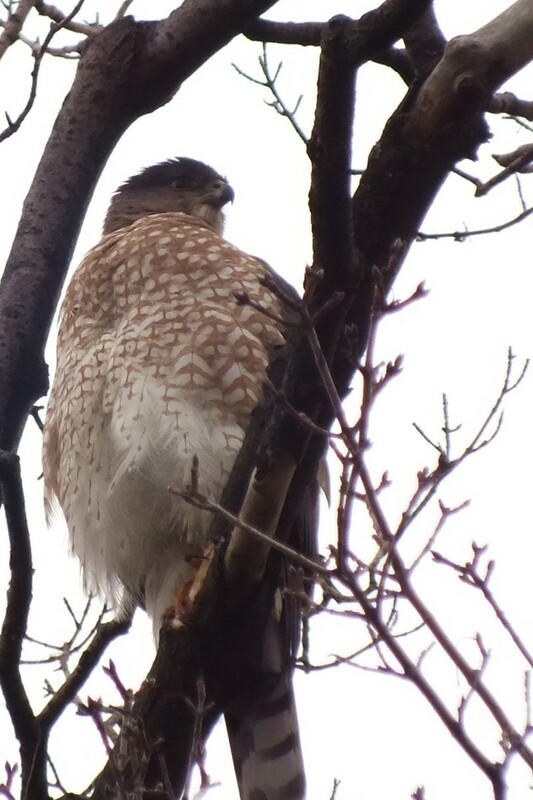 At one point in history, the Cooper’s Hawk was actually called the “chicken hawk”. 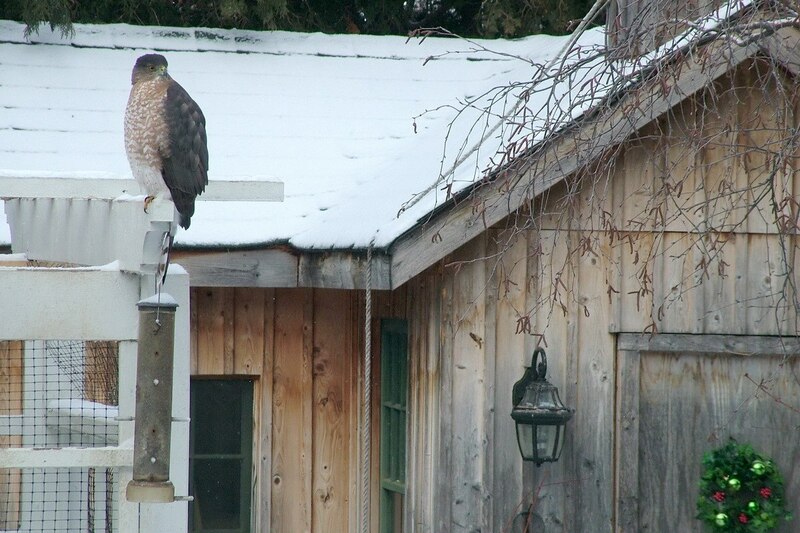 When my dad kept chickens in his backyard, this type of hawk was always feared. Needless to say, back then, Cooper’s Hawks (Chicken Hawks) paid a big price for their preference for chickens. Today, these hawks spend a lot more time hunting wild prey, not domestic birds, and as a result, they are no longer killed off. I love the way the wind in the treetop fluffed the thick and bountiful feathers of the hawk’s chest. It certainly wouldn’t be feeling the cold. 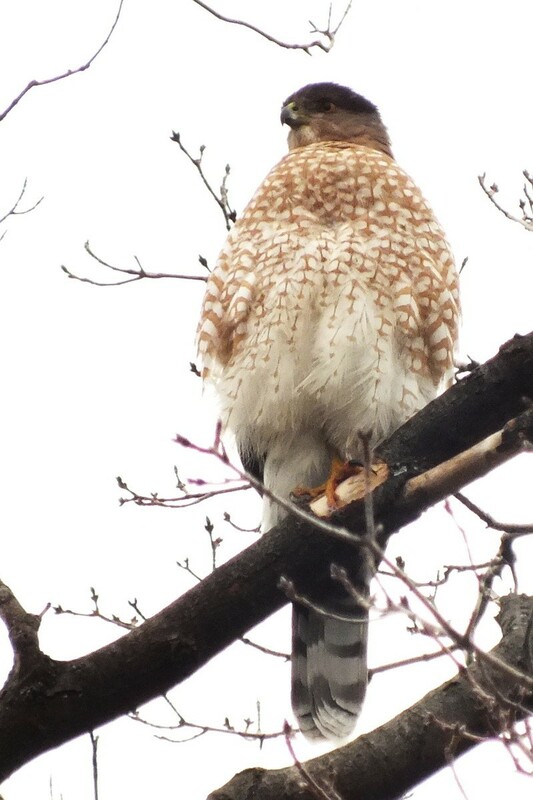 As we stared up at the hawk, he in turn stared right back at us. 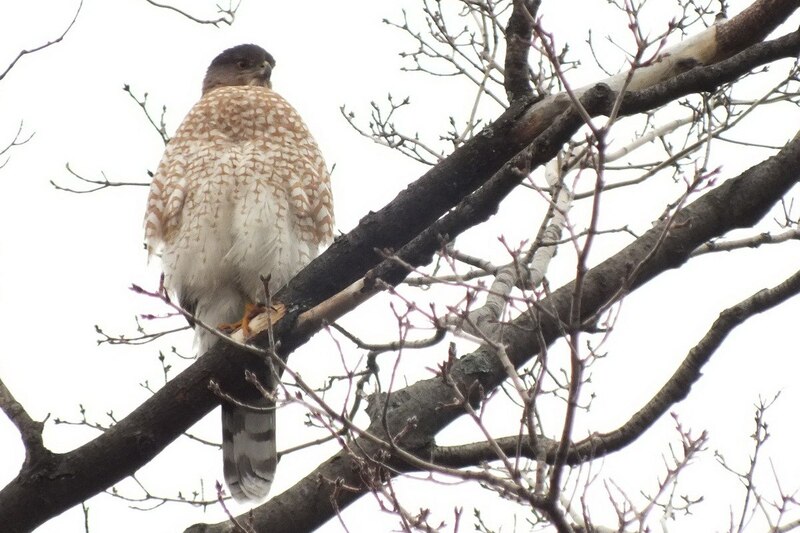 At no point did he seem threatened, but if a Red-Tailed Hawk had happened to fly into the area, the Cooper’s Hawk would have been on high alert. 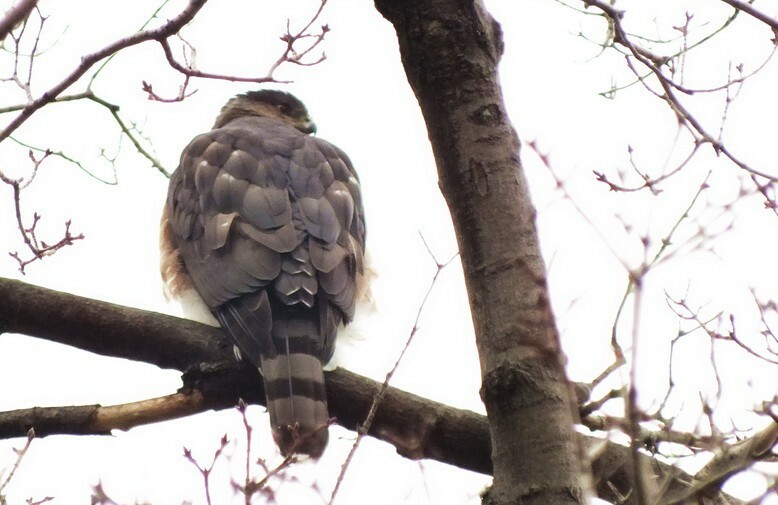 These are the most feared predators of the Cooper’s Hawk. So the cycle of life is truly played out in the trees and in my backyard. Terrific post and photos’! You obviously have a passion for our feathered friends. Indeed we do Daniel. Glad you enjoyed the post! Hi Daniel. You are right. Bob and I really feel protective of wildlife and birds in general. In today’s environment, and with climate change such a huge factor, I worry for their welfare and continued existence.